Trusting your influencers can be hard to do. Fake followers and bots are now firmly entrenched in the social media machine, and an astounding number of social media influencers use these false accounts to bolster their stats. The sheer scope of follower falsification is what launched Unilever’s marketing chief Keith Weed into a recent diatribe against influencer dishonesty, calling for more oversight on the part of social media platforms to eliminate, or at least reduce, the fraudulent behavior of buying followers. And it is true that the problem is rampant: An influencer with 50,000 to 100,000 followers likely has 20% fake followers lurking among her true fans. Granted, as even Unilever’s Weed points out, this is the work of “a few bad apples.” Not all influencers buy followers, and some skillful sifting can easily separate the wheat from the chatbots. But once you’ve found influencers you can trust, it’s vital that you extend that trust into legitimate creative freedom to create the content that they see as the best fit for their audience. Helicopter marketers, take heed: Micro-management and hand-holding has no place in today’s social media influencer marketplace. It would be ageist and unwise to insinuate that influencers are the child in a parent-child metaphor (the marketer in this case being the parent.) But for the sake of making a point, let’s consider the real-life “trust fall” of watching your 16 year old drive off in the family Subaru for the first time. You’ve taught her how to drive (stick and automatic, you’re no dummy) and made sure she understood the rules of the road. But once you’ve handed her the keys and watched her back out of the driveway, you no longer have control of where she’s headed. And as any teenager would agree, that’s a very good thing. Why is it a good thing? Well, in the case of parenting, it shows that you respect the teenager and trust she will act appropriately, which deepens your relationship and allows her to feel confident in her next steps. In influencer marketing, that’s also the case — with the crucial added bonus of creating vastly improved creative content. Only with your complete trust can your influencer take your creative brief and turn it into content that his or her followers will truly connect with, listen to, and engage with. An informed influencer with full creative freedom can have an enormous impact on your sales. But that means ixnay on the micro-managing may. Why does creative freedom matter so much? Any social influencer worth his or her salt has spent years cultivating an audience. The sheer volume of hours spent hustling for likes, shares, comments, and follows can be staggering to even consider, but there are rewards to this labor. One of these rewards is a deep knowledge and understanding of what that unique audience wants, needs, and responds to. Nothing you can suggest or creatively direct as an outsider brand manager (even one as obviously brilliant as you) can possibly touch what a social influencer innately understands about their tribe. That’s why you need to let them have as much creative freedom as you can possibly muster, to create content that’s most likely to make waves within your influencer’s audience. Otherwise, the content you worked so hard to procure will feel as fake as those fake followers, and absolutely none of your sales goals will be met. Part of enabling an influencer to create his or her best work for your brand is to make sure they’re satisfied with their, ahem, remuneration. Influencers who feel undervalued will not feel motivated to put out their most valuable work. Of course, don’t let yourself be fleeced, either! Instead, conduct some serious research on what an influencer in your vertical should be paid (here’s a start) and offer a number that feels appropriate for your goals and what you expect to receive in return. Trust your gut — and your influencer (again, provided they’ve earned it). Just because you trust your quarterback doesn’t mean you don’t have another one sitting on the bench in the event of a blitz. Accidents happen, timing can backfire and even people you trust can let you down. Humans are humans. So it would likely be worth your while to have one or two backup influencers in your back pocket, especially if timing is an issue (for example, if you need content to coincide with the set date of a product launch). Trust us, you’ll breathe easier knowing you have options. 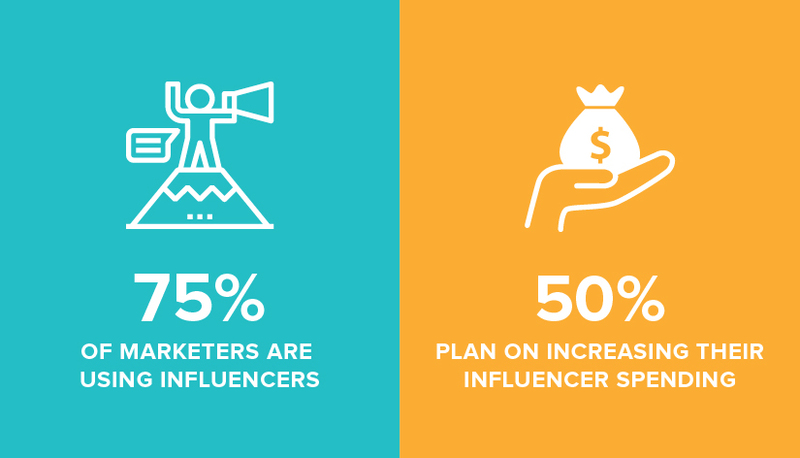 According to the Association of National Advertisers, 75% of marketers are using influencers now, and 50% of these plan on increasing their spending in the near future. And no wonder: In a world of fake followers and social media bots, it can feel like there’s very little for consumers to trust in when it comes to the online world. Influencers work hard to gain the trust and loyalty of their audience, and in so doing they’ve created a space where their fans can congregate and appreciate what they consider to be real, authentic and enjoyable. When influencers partner with a brand to create content, that content needs to convey that same authenticity and honesty, or else it will fall flat. But if that content is done well, and really resonates with your influencer’s audience, you’ll have done your brand a tremendous service. It’s all about choosing the right influencer — and giving them the trust and freedom they need to excel. Eager to get to the next level of trust with your customers? Schedule a free consultation with us today to learn how our design, development and strategy teams can get you where you want to be.